Jurors for the trial of South Thanet MP Craig Mackinlay and two former aides at Southwark Crown Court are due to be selected and sworn in tomorrow (October 16). Mr Mackinlay, 52, and former election agent Nathan Gray, of Hawkhurst, and party activist Marion Little, from Hertfordshire, were each charged with offences under the Representation of the People Act 1983 in relation to expense declarations during the General Election. The accusations relate to the local election spend during the Conservative campaign in 2015 and whether it was wrongly attributed to the national campaign spend. Mr Mackinlay took the seat ahead of then UKIP leader Nigel Farage with a majority of 2,182. The case opened at Southwark Crown Court today and is expected to last for several weeks. All three deny the charges. Aftab Jafferjee QC will represent the prosecution and Richard Pratt QC, Northern Circuit, will present the case for the defence. 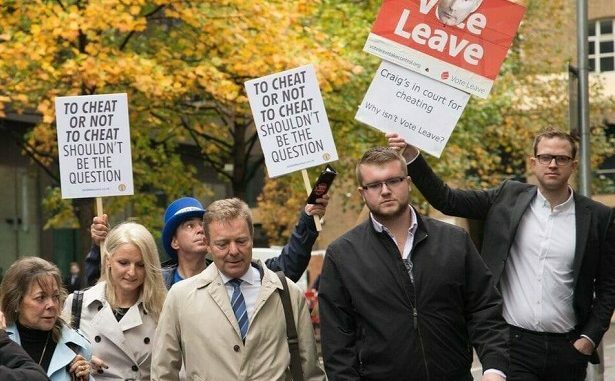 Mr Mackinlay was faced with anti-Brexit campaigners outside of the court, including Rob Yates from Margate who created the Thanet 48% group to promote the EU Remain case. Mr Yates has also be threatened with eviction after placing a large Brexit sign in his Arlington House flat window. The Remain campaigner will attend the People’s Vote March in London with a Margate contingent on October 20. The election expenses trial had initially been due to begin at Southwark Crown Court on May 14 and was scheduled for six weeks. This was delayed while a pre-trial appeal was heard by Lady Hale (President), Lord Mance, Lord Hughes, Lord Hodge and Lord Lloyd-Jones at the Supreme Court. A judgement on that appeal was issued on July 25. The big question is: Why aren’t Leave campaigns being investigated in the same way/at the same speed as Craig Mackinley? The Electoral Commission has already forwarded their findings (i.e. that the law has been broken by Vote Leave and associated) and Met Police have – after 90 days and counting – still not acted upon it, citing “political sensitivities” as the reason. Outrageous. Whether Leaver or Remainer, everyone should be on the streets about this. I have no idea whether Mr Mackindlay has done anything wrong at all. But , surely, the far greater injustice is the fact that one Party, the Tories, are able to receive millions of pounds in donations from very few,very rich, people, which keeps them solvent and in the public eye. Especially as they have the support of most daily and weekly newspaper owners. Whereas other Parties have to rely on small donations from their members and to try to compete , effectively, with the Establishment and all its power and wealth. No wonder the Tories often win elections! And , “no”, the Trade Unions do NOT give anything like as much to the Labour Party and , anyway, Trade Unions are democratic bodies that need members votes to decide on financial matters whereas private millionaires and Corporations make up their own minds how much to give to the Tories and don’t need to go to a vote of their employees. And as for the vast sums that seem to have been spent on getting the (narrow) Brexit vote, will no-one investigate? I wonder why the Mackinlay case has’nt been classified by the powers to be as ‘not in the public interest to pursue’! as was the case for the majority of the highest ranking and some of the most wealthy MPs in the country regarding their personal expenses fiasco. Surely the vast majority of those who put in false expenses claims should have been prosecuted because it WAS in the publics interest. But no , that was definately not going to happen! If someone breaks or abuses the rules they should ALWAYS be accountable but why do we shout and scream when a minor does the same and accept the majority of cases that really do cost this country vast sums of money, with OH WELL what can we do. Talking of the abuse of vast sums of money! Would anybody give vast sums of their personal money to a company/association/club etc for over 30yrs when that association have never once issued a receit or had their financial yearly accounts audited to a successful conclusion and legally signed off and released to the public office of each country involved ? MADNESS you would say ! But STILL we pay ! in orderand start with the biggest/costliest and most important issues first! In my opinion most of the MPs of this country should be in receit of a criminal record. All overseas payments should be frozen immediatly and be indiviually assessed. All monies to Europe frozen untill they can prove where the monies have gone each year because the auditors don’t know either. Run out of time not ink 😂 HAVE A NICE DAY !